The star over Bethlehem is a major symbol of Christmas—we sing about it, put it on the top of Christmas trees, even wear it on neckties—yet if you read the story closely, only a few wise men saw and understood the star. 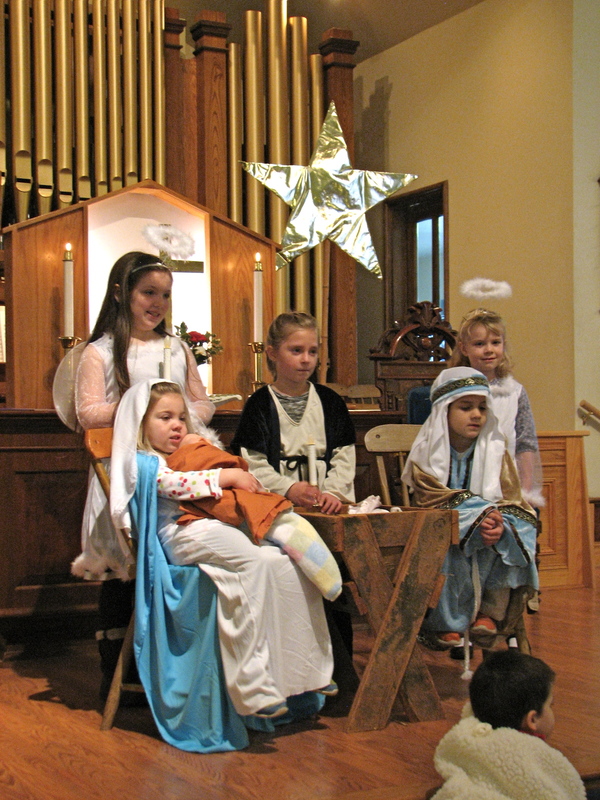 The shepherds did not notice a star, nor did anyone else. Would we have been among the wise? Are we seeing the stars of Christ around us now? Do we understand the signs of light that God is giving us that can fill us with hope and inspire us? The wise men saw and were moved for a reason: they were looking, they were searching the skies for meaning, they had practiced and made themselves students of the light. They were part of a tradition that passed wisdom along to them. They added their own knowledge and experience and were open to something new happening in their day. We need to practice looking and finding meaning, too, if we want to be among those who see signs of Christ’s presence in our world, who see the light and understand what it says and follow where it leads. We need to be open to learning the wisdom of our tradition and being changed by the new things that God is doing. “See and be radiant,” is a good job description for a follower of Christ. It is a good motto. The more light of God we see within and around us the more brilliantly we will shine like a lighted window. So on this New Years Day it would be good to look and reflect on where the star of Christ might be shining now and in the year ahead so that we may see and be radiant, we may see and celebrate, we may see and follow where the star leads. The Magi had a map of the sky that helped them understand what they were seeing, and we have a map, too. It is called our Identity and Aspiration Statement. We worked long and hard with the Spirit’s help to develop its collective wisdom. It tells us what stars to look for that say that Christ is being born among us. Our map tells us to look for signs of being an “increasingly welcoming, loving, helpful congregation.” I have heard some of you say that this is your church because the first time you came here people reached out to you, eager to learn who you were and share your struggles and joys. People not only got to know you, they invited you to come back and participate. When you needed help, they were quick to offer it. You felt accepted and affirmed and supported just as you were. You were home. Every time we see that happen in the coming year for someone who is new or for someone who has been here for decades, we should know that we are seeing a star of Christ at its rising. We can see and be radiant with the joy of it, because it means that this congregation will thrive. The map says to look for it happening increasingly—that means more of us reaching out, and our reach stretching—not just to new people who seem to be like us, but having the courage to throw our loving embrace as wide as Christ did and include those who are treated as outsiders or outcasts elsewhere, expanding our comfort zone, making this a home for all people. Is the church full of meaningful interaction—deep conversation and laughter and tears? Are we taking care of one another? Are children cherished and people of all ages encouraged and supported? Can you feel the warmth of beloved community here? Can you feel joy, peace and Christ-like love? Does it seem to be getting brighter and brighter? If the answer to any of those questions is yes, you are witnessing a star of Christ rising at his birth. See and be radiant! Some of these stars are easy to see. Our Board of Mission and Social Action organizes our love into effective projects, supplying refugees with household items they need in their new American homes, or providing Church World Service kits for people whose lives have been devastated by natural disaster or war. The love we have found here serves free community dinners for the hungry and lonely in Bradford, and reaches all the way around the world to rural India to provide schools for children in extreme poverty. Other stars are harder to see. Every one of us takes the love we find here out into the world in quiet ways. We offer a smile or a small act of kindness to a stranger at the store. We are more patient drivers and generous-hearted family members. We serve on town committees. We deliver meals to sick or struggling neighbors. We contribute to groups that are working for peace and justice. We may not think of these individual acts as being part of the church, but if what happens here inspires or influences our actions, then even when we act alone we are acting as part of the body of Christ, and all our good works together add up to a brilliant star over Bradford showing where Christ was born. See and be radiant! Make a habit of celebrating what those around you here do as individuals, and you as a church will shine more and more brightly through this window. Isaiah and Jesus are clear that the light we find is not for us alone, but for us to share with the world. See and be radiant! See the wonderful things this church is already doing and let the light of Christ’s presence in it all move you to shine even more! The people out there in the darkness need you to do this.